Journey of an engineering student to Social Innovation! "Like many who change the dreams every day, same was I, I dreamt of being IAS officer, Interior Designer, Pilot, Doctor, Mechanical Engineer and many such, but Criticisms often pull us down, and increase the inferiority complex in us, but what makes us alive in such situations and lead us to light is our DREAMS! But what if, we are unsure as to how to turn our dreams to reality, and what it actually takes, to turn our dreams into reality? This question will again pull our belief levels down, and at the end we settle for something less and keep our dreams aside and lead life! A life of no meaning. But I don’t want to be one among them, who settle at mediocrity" - were the words said by Achyuth.S.R who is pursuing his 2nd year engineering at KSIT college, who is an ardent dreamer, with a vision to lead the society towards betterment with simple and effective projects to execute, which would create an effective impact on the society that we all live in. 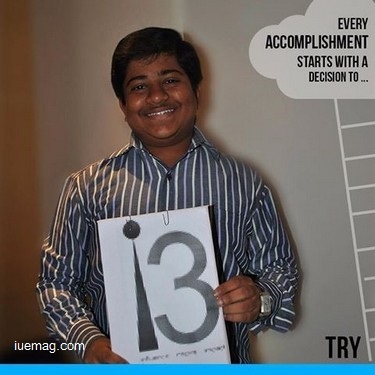 Achyuth got an new edge to his dreams, when he joined a platform named i3 (www.iuites.org), in one of the weeks of i3 he innovated a project named NPP – Note Pad Project, where he used the hard bind cardboard of used books, and gave it a look that is lucrative by pasting white sheets on the either side of cardboard and affixed 2 paper pins on top, these notepads were gifted to government school children of different schools. The principals had nothing less than the laurels of appreciation in return to the tremendous work executed by him. Now this project shall be under the guidance of IU Cares (www.iucares.org). And recently this project was executed by IU cares volunteers in different government schools. The idea takes all the appreciation, as it's simple and involves efficient use of available resources. Apart from this, he has been an active participant on various social projects like 36meals, Women Empowerment, E4U, IUY2C, IUOSB, I3CLC, SEPC, IUNPB impacting close to 7000 people and his contribution towards the society is impressively admirable. He was the True IUITE of i3 Season 3 Bangalore, he was responsible for a seminar on youth empowerment at KSIT College, and has been an active participant at various seminars from his school days. He envisions to be a public speaker and as person who shall ever be remembered as a contributor to the society! His message to the youth of today is “Create your own mark, where ever you go and live a life which shall leave an example to future generation”. Any facts, figures or references stated here are made by the author & don't reflect the endorsement of iU at all times unless otherwise drafted by official staff at iU. This article was first published here on 4th September 2015.